Finally! Microsoft Corp announced their own made tablet computers called "Surface" at the Milk Studios in Hollywood during its Los Angeles press event last June 18, 2012. 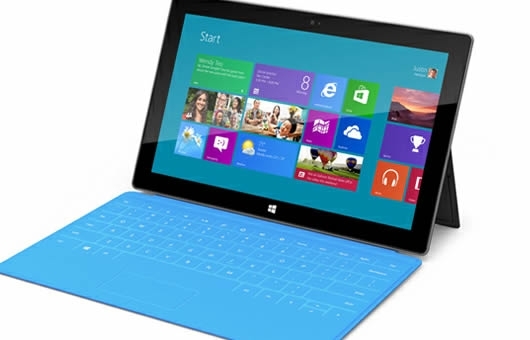 Surface Windows 8 tablet will be available this coming Christmas shopping season, according to Microsoft. Are you looking for the specification of Microsoft Surface Windows 8 tablet? Well, as of now the company is not giving any details the same with the pricing. But they gave a hint that it is comparable to Apple's new iPad, heavier but slightly thinner, with 10.6 inch screen and comes in 32GB and 64GB memory capacity. Microsoft CEO Steve Ballmer said, " 'didn't want to leave anything uncovered' as it rolled out Windows 8." Windows 8 is the new software of Microsoft in which they decided to general release it together with the lighter, thinner version of the Surface tablet with a chips designed by ARM Holdings. Microsoft aims to triple the sales of tablets in the next two years, topping the 180 million in year 2013. Comments or suggestions about "Microsoft announced the Windows 8 Tablet Surface" is important to us, you may share it by using the comment box below.